A former attorney, Humberto Aguilar served 77 months in prison for money laundering and participation in a client conspiracy to violate the importation of dangerous narcotics. During the final lunch session, he told attendees, "There should be a law that if you are under 30, you're not allowed to make a million dollars. Because you don't appreciate it. Because you say after the first million, 'I can make another one.'" James D. Ratley, CFE, ACFE President and CEO, delivers a message welcoming attendees to San Antonio and touches on the changes the ACFE has seen since its inception 25 years ago. 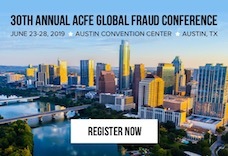 ACFE founder and Chairman, Dr. Joseph T. Wells, CFE, CPA, gave a final address to attendees at his last ACFE Global Fraud Conference, including 10 key pointers to fighting fraud. "It's hard for me to put into words what this organization has meant to me. But I didn't make the ACFE what it is, you did." Humberto Aguilar’s life has been a study of polarizing contrasts. He told conference attendees at Wednesday’s general session that after graduating from the University of Florida Law school in 1978, he wanted “to be the best criminal lawyer” he could be. Yet, shortly after beginning his law practice he began laundering money for his drug-dealer clients. He was in the running for a state judgeship, but, in 1990, he was indicted on 27 counts of racketeering, money laundering and other charges for assisting his clients. “I went to prison because I committed a crime,” but he also said, “I never considered myself a criminal.” He was a peace-loving attorney who never stole from his clients, but he shot two hit men in a defensive gunfight — wounding one and killing another. Jim Butterworth, CFE, and executive director of services at ManTech, explored virtual currencies, such as Bitcoin (BTC), in his session, “Bitcoin and Virtual Economies: Fraud’s New Best Friend.” In this breakout session, Butterworth explored the concept that while virtual currencies may be the future of financial technology, they’re also stepping stones to the expansion of fraud’s playground.